The story I know about American cooking comes from Julia Child’s retrospective introduction to the 40th Anniversary edition of Mastering the Art of French Cooking. Large, largely unseasoned, platters of beef, next to sculpted marshmallow salad in aspic. Casseroles that called for a potato chip topping. Well, these last two images rightly induce horror in you, gentle reader, and I was lucky to largely avoid these canned-food-concoctions as my Dad, the cook in the house, had a far more Cajun and French aesthetic, seemingly from nature. But every now and then my Mom would cook, and as she claims to be less “creative” than Dad, she fell back on her 4-H and Pirate’s Pantry favorites. 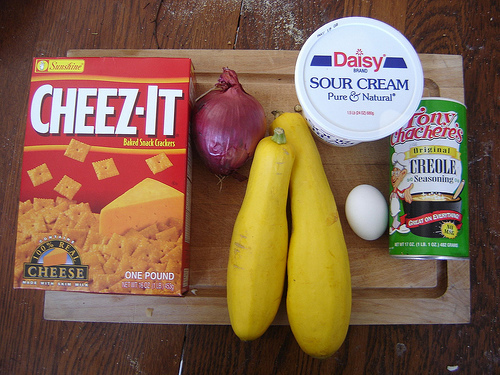 Such as Cheesy Squash Casserole. Submitted to pictured cookbook by the wife of the lead singer from Dad’s band in high school. Which casserole is really really good. To eat. What I want to stress is that this is the exception to the Betty Crocker rule that Julia Child talks about. (I still can’t smell a tuna melt without feeling nauseated.) This casserole rocks, and let’s face it, casseroles are easy ways to satisfy those cranky housemates/relations by blood or marriage. (An aspect of cooking Julia Child herself is always sensitive to.) And these Cheez-It crackers (substitute your favorite off-brand) aren’t really that bad for you–of course no dietary fiber, but no trans fat, and some protein. And so I give the recipe to the world, and especially KJ, because I know she will appreciate it. this year’s Queen of Barataria. FOR ABOUT 30 MINUTES. ENJOY.